Lewis Hamilton was in a league of his own in the final practice at the Russian Grand Prix despite a spin. Hamilton was one second clear of his rival for some time, although Mercedes team-mate and title rival Nico Rosberg eventually got to within 0.29 seconds. 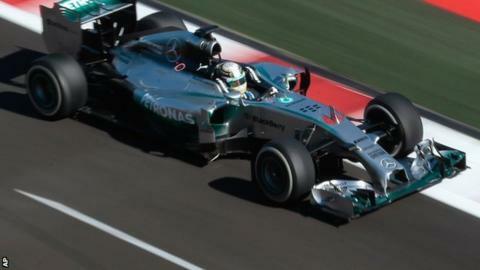 That was late on after Hamilton lost control in the penultimate corner without damaging his car. Rosberg was 0.081secs quicker than Williams's Valtteri Bottas in third. Red Bull's Daniel Ricciardo was fourth. At the time he set his fastest lap of one minute 38.726 seconds, Hamilton was 0.96secs quicker than Rosberg, who was himself 0.036secs slower than Bottas. The Briton was then on an even faster lap, poised to improve by at least a couple of 10ths of a second, when he locked an inside wheel and spun going into Turn 17, coming to rest just before the tyre barrier. Rosberg tried again and managed to reduce the gap, but Hamilton's form suggests he is a strong favourite for pole when qualifying starts at 12:00 BST. Mercedes F1 boss Toto Wolff said: "It was a tremendous lap. He seems to extract the maximum out of the car at the moment." Asked why the margin between the two Mercedes drivers was larger than normal, Wolff said: "It's bizarre. We have just discussed why Lewis seems to nail it on the first lap and Nico seems to struggle a bit more. But it is only free practice, there's a lot of set-up changes to happen before qualifying." Williams look to be Mercedes' closest rivals on track, while Red Bull have made a step forward after struggling on Friday. But the Red Bulls look like they may face a challenge from their own junior team, with Daniil Kvyat in impressive form at his home race, which is on Sunday to be visited by Russian President Vladimir Putin, who was instrumental in it happening. The weekend continues to be overshadowed by the accident at last weekend's Japanese Grand Prix that left Marussia driver Jules Bianchi in a critical condition with severe head injuries. Teams and governing body the FIA have been discussing changes to be implemented to try to ensure such an incident cannot happen again. Further down the field, the second Williams of Felipe Massa was fifth, ahead of Russian Kvyat in the Toro Rosso, the Ferraris of Kimi Raikkonen and Fernando Alonso, Toro Rosso's Jean-Eric Vergne and Red Bull's Sebastian Vettel. McLaren's Jenson Button was only 11th fastest after impressing in Friday practice. His team-mate Kevin Magnussen suffered a gearbox failure early in the session. The part will need to be changed ahead of qualifying, which means the Dane will be hit with a five-place grid penalty.